The awards given out each year by the Council of Fashion Designers of America are a big deal—fashion’s equivalent of the Oscars. In 2000, Mr. Valentino became one of the first non-American designers to take home the CFDA’s Lifetime Achievement Award. 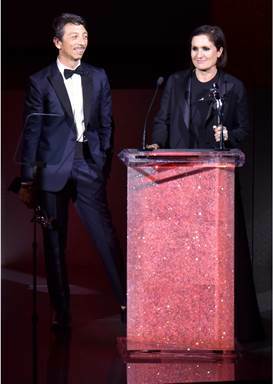 And on June 1st, Mr. Valentino’s protégés, Maria Grazia Chiuri and Pierpaolo Piccioli, received an award of their own as the CFDA membership convened for its 2015 gala. The presentation of the coveted International Award to Grazia Chiuri and Piccioli was one of the highlights of the star-studded event. Attendees such as Kanye West, Kim Kardashian, Karlie Kloss and designer, Valentino friend and CFDA President Diane von Furstenburg were treated to a screening of the short film “A Tribute to Iconic Values,” by Roman director Francesco Munzi, which paid homage both to Grazia Chiuri and Piccioli’s innovations at Maison Valentino, since their appointment as joint creative directors in 2009, and the myriad ways they have carried on the house’s heritage of timeless elegance andnonpareil hand-craftsmanship. Following the film, Vogue Italia editor Franca Sozzani and acclaimed actress Valeria Golino ascended the stage to give Grazia Chiuri and Piccioli their prize. Von Furstenburg offered the pithiest explanation for the CFDA’s decision to recognize Grazia Chiuri and Piccioli the International Award this year, when she told the New York Times that the duo “have taken the iconic brand of Valentino into the new century while respecting its values and sense of perfection.” Next up for the newly-minted International Award winners? A return home: Next month, Grazia Chiuri and Piccioli will be showing the Fall/Winter 2015 Haute Couture collection not in Paris, but a stone’s throw from the Maison Valentino atelier, in Rome.